We bill ourselves as a non-profit venture, with any profits we make going to charity. The truth is that we have yet to make any profit! So until we do, we have occasional events such as coffee mornings to raise a few funds. We are also starting this year to support a different charity each month, a range of local and national charities. Our charity of the month for January is the Warwickshire and Northamptonshire Air Ambulance. We have resurrected our Blind Date with a Book idea (not just novels any more, we will be including some non-fiction), and these will be part of our charity fundraising. These are ready-wrapped books, and all we put on the outside is the genre. They are £1.50, of which 50p goes to the charity of the month, and they now have the added excitement of a surprise voucher in each one! Some may just have a 50p voucher for the bookshop, others contain a voucher for a free film admission, some give money off music gigs, and so on. More info on fundraising events as we devise them! One of the things I am going to do at the bookshop this year is to support a different charity each month. As a non-profit organisation, our profits would be given to charity…but to be honest, we haven’t made any profit yet! I hope one day that we will. But in the meantime, there are things we can do to support charities and make our status a bit more obvious and useful. I will be choosing a different charity each month, therefore, a mixture of local and national charities, and hope that this makes things more transparent. This month’s charity (January 2016) is the Warwickshire and Northamptonshire Air Ambulance. We will be holding coffee mornings (or more likely, afternoon tea, for reasons stated in my previous blog post! ), and will be thinking of other ways to raise funds. 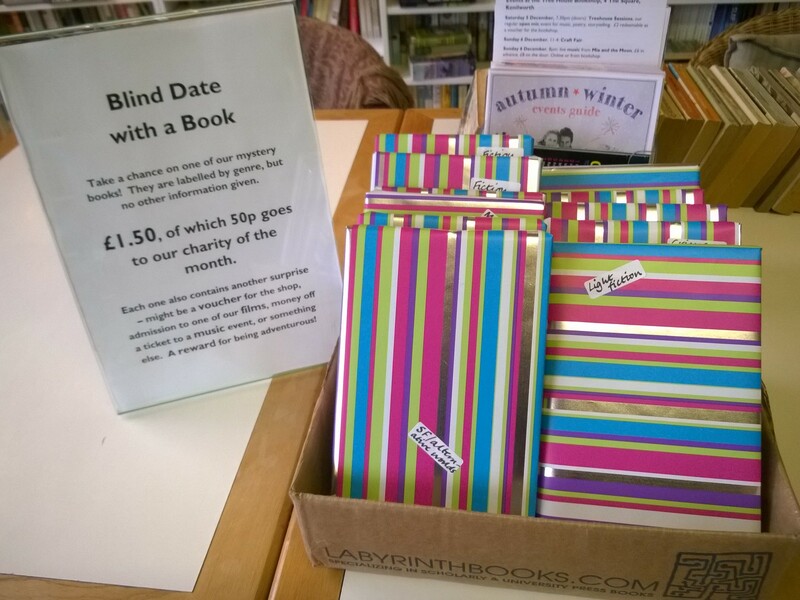 We used to have a ‘blind date with a book’ scheme, which I resurrected at Christmas, and it proved popular. We wrap books so that you are getting a surprise, so you need to be a little bit adventurous, but we give some basic clues as to the sort of book inside the wrapping. This will probably be no more than an indication of whether it’s a novel, a history book, a biography, etc. These will be £1.50, with 50p going to our chosen charity of the month – and there is the added surprise of a voucher or other offer inside. The amount and nature of the voucher will also be a surprise, some will be more valuable than others! But I am hoping that the whole thing will be a bit of fun, as well as great for when you don’t know what you want to read, or want a fun present for someone else. These will be available from Tuesday 5 January. I will be thinking up other ways of adding to our monthly giving, including specific events, maybe some raffles and things for children to do. More information as these things develop! In the meantime, we are now back to routine opening hours, which essentially means Tuesday-Saturday, 10am to 5pm. We will be open on occasional Sundays, and there will also be some Sunday events coming up. We will be closed on Mondays – so if anyone wants to hire the space during the day on a Monday, do get in touch. Our rates are £10 an hour.